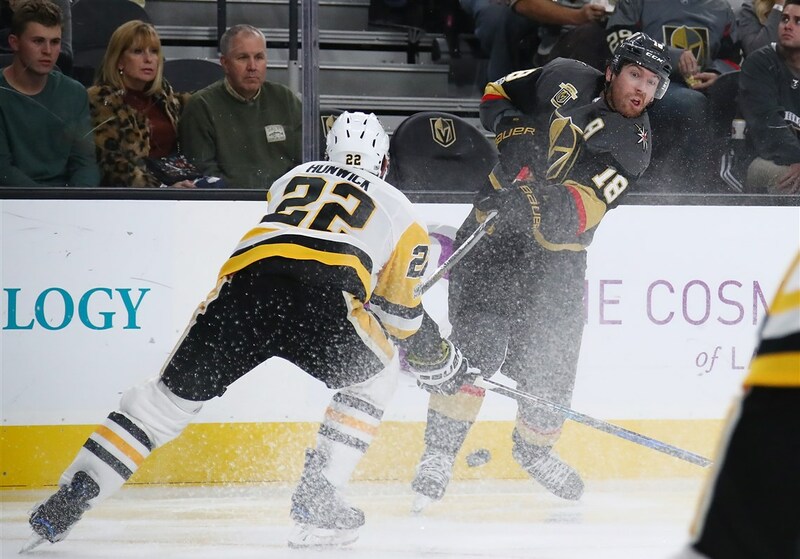 James Neal taking a wristshot from the half-wall on the Penguins' debut game against the Vegas Golden Knights. Here we are in the middle of December looking at the 2017-18 playoff race from the outside looking in. It's not a big deal, we've been here before and rallied late. Teams want to get hot down the stretch, but the Penguins will ever so surely run out of time for adjustments if they don't make changes soon. Of course we can't expect to win the Stanley Cup every year, but I also don't think the Penguins are very far away from seeing the same success that we've become so used to that we take for granted. So, what needs to change? Well, for one - the Penguins are in the bottom-five in the NHL in goals against. The Penguins have been blown out a few times, so this statistic is dogged by a few outliers - but when you're 16-14-3 that statistic is more telling than if they were at the top of the Metropolitan Division. The defense looks out of place and the backchecking by the forwards has been questionable. Is the defense tired? Maybe. Are the forwards tired? Well, they don't seem to be getting around the ice like they used to. They've played a lot of games - and beyond that, they're playing a lot more than they used to. When you've played between 20-50 more games than any other team over the last two seasons, sometimes less is more. In the 2016-17 season, the Penguins were famous for rolling four lines. This year, the Penguins have not played the lines as evenly - and point production is down. Below are a couple of tables to help illustrate this issue. The first table is the Penguins' four centers in 2016-17, their average time on ice per game, average even strength goals/assists/points per game. The second table is the same for 2017-18 through the first 33 games of the season. The final table is the year-over-year change between all values of the prior two tables. The first thing that stands out to me - and I hope stands out to you, is that the third-line center problem seems to be more found in fiction than fact. Riley Sheahan is not the problem. Sure, he doesn't have a cool nickname like "Bones". He didn't have a prolific playoff line that was named after a WWF wrestler. But, with almost 10% less ice-time he's putting 20% more points on the board for the Penguins. Can we upgrade from Sheahan? Sure. Is he doing any worse than the third line center who led us to back-to-back Stanley Cups? Not as far as I can tell. The second take-away is that Carter Rowney is basically a meme. He is not eating any minutes for this team. He is producing only 30% of the points that Matt Cullen did - and Matt Cullen did not score much in 2016-17 to be frank. The fourth line is abysmal. Ryan Reaves is a favorite target of fans "mad online" about the draft. He may have been a bust, but maybe not. But playing him only a handful of minutes a night, and spending the rest of the minutes in the box or bench isn't going to help the Penguins increase 5-on-5 scoring. And the final take-away is that Sid and Geno just aren't doing enough in 5-on-5 hockey. They are scoring plentifully on the power play, and Phil Kessel has had a booming season to take away some of the spotlight from "under-performing stars" (the easiest target in Pittsburgh any time they aren't winning Stanley Cups) - but something needs to change for Sid and Geno in even strength hockey.